She-Hulk #9 is a courtroom drama with Daredevil facing off against She-Hulk in Los Angeles Superior Court over the wrongful death case of Sam Fogler in 1940, as accused by Sam Fogler’s brother Harold Fogler on his death bed in 2014. Matt “Daredevil” Murdock would have to prove that Steve Rogers’s actions in 1940 were “wrongful acts” or “negligent” in causing the gunman to murder Sam Fogler under Cal Code Civ Proc § 377.60. 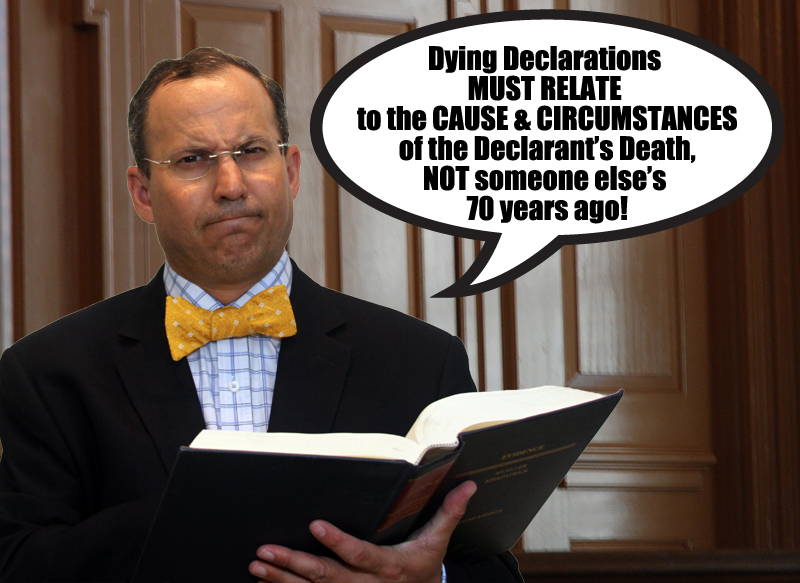 Problem: All of the trial advocacy and rules for Dying Declarations are wrong. 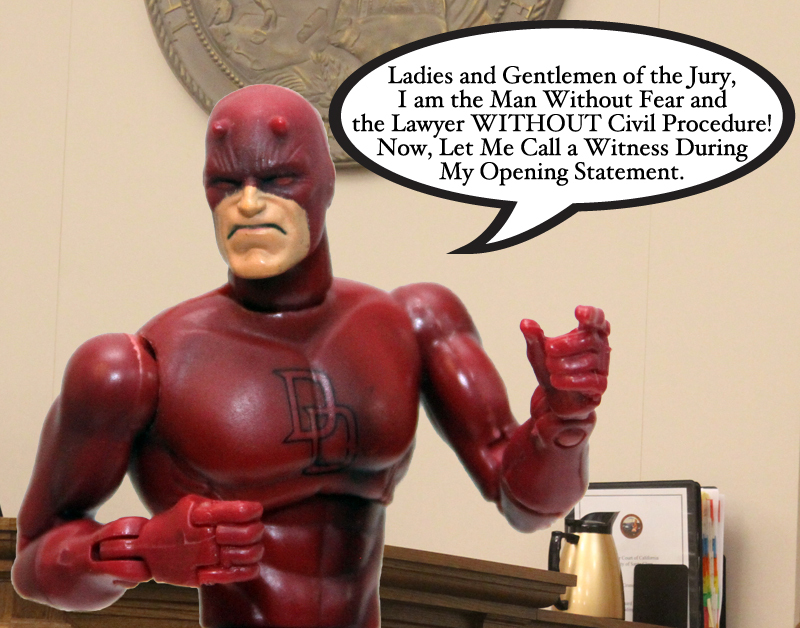 The story begins with Matt Murdock giving his opening statement for the Plaintiff. Opening statements are where lawyers provide a road map of what evidence they will present that supports their case. The court may then charge the jury. Murdock could not call a witness during his opening statement. That is just not how a trial is conducted. The witness offering testimony during the Plaintiff’s opening statement was a police officer who heard the dying words of the grandfather of the Plaintiffs. The police officer recounted the dying man’s story, blaming Steve Rodgers for the death of the decedent’s brother in 1940. The “death bed” story did not include any quotes from Steve Rogers, but claimed that the cause for the gunman shooting Sam Fogler was because Rogers would not stop talking after being threatened by the gunman. None of that testimony would be admissible, because it is hearsay without a valid exception to the Hearsay rule. Hearsay is “a statement that was made other than by a witness while testifying at the hearing and that is offered to prove the truth of the matter stated.” Cal Evid Code § 1200(a). 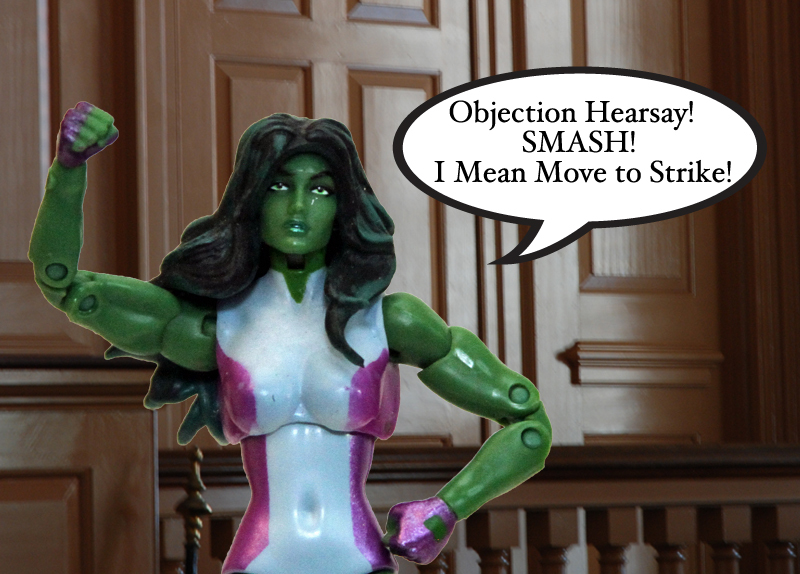 Hearsay is not admissible, unless there is a valid exception to the Hearsay rule. Cal Evid Code § 1200(b). Cal Evid Code § 1242. The Dying Declaration exception is NOT valid here because Harold Fogler was dying of old age, NOT because of events in November 1940. There is no causal relationship between the decedent’s cause of death and the events of 1940. As such, the Dying Declaration exception is not applicable to the police officer’s already procedurally improper testimony, and should be stricken from the record. This would effectively gut the Plaintiff’s case. The Plaintiffs also called a police officer to read a police report from 1940. This document technically contains layered hearsay, because the writing itself and the quote in it each require an exception to the Hearsay rule to be admissible. (d) The sources of information and method and time of preparation were such as to indicate its trustworthiness. Cal Evid Code § 1271. The testifying officer was the archivist for the Los Angeles Police Department and could attest to the trustworthiness of the “ancient” document. Steve Rogers is quoted in the police report stating, “This is all my fault. I could have stopped it.” That quote would be admissible as a party admission, because it was a statement “offered against the declarant in an action to which he is a party in either his individual or representative capacity, regardless of whether the statement was made in his individual or representative capacity.” Cal Evid Code § 1220. Could Steve Rogers’ 1940 statement be enough to sustain a case for wrongful death under California law? It is difficult to find Rogers’ unknown statements to the gunman as the proximate cause for Sam Fogler being shot by the gunman. Rogers did not fire the gun, which would make his unknown statements highly suspect for establishing liability for the murderous actions of another. There is simply no evidence that Rogers’ conduct was “wrongful” or negligent other than the accusation of a dead man. The statute of limitations in this case had long since passed in 1942 pursuant to California Code of Civil Procedure section 335.1. The police in 1940 knew of the Sam Fogle’s death and Steve Rogers’ statement. Despite all of that information in 1940, the Los Angeles District Attorney did not press charges. There was no valid excuse for Harold Fogle to do nothing with this information for 70 years. If there had been a case, November of 1940 would have been the time to press criminal charges or start a civil lawsuit by November 1942, at least two years (possibly three) before Captain America was frozen in ice.